1. First make the almond topping. Preheat the oven to 180°C/gas mark 4 and line a baking tray with baking parchment. Mix the almonds, icing sugar and rum in a bowl then spread them out evenly on the tray. Caramelise in the oven until golden brown; this takes about 6 minutes but you should be able to smell when they are ready. Remove and set aside to cool. 2. Sit the sponge on a large plate (cut to size if need be) and sprinkle with a few tablespoons of PX sherry until nicely boozed up but in no way sodden. 3. Remove the ice cream from the freezer and put in the fridge to soften a little. 4. To make the meringue, gently heat the caster sugar, glucose and water until the sugar is dissolved. Increase the heat and, using a sugar thermometer, boil until the syrup reaches about 110°C. At this point beat the egg whites in an electric stand mixer or with the hand-held mixer until stiff. 5. Remove the syrup from the heat when the thermometer reads 121°C. Turn the mixer to its lowest setting and beat the whites while pouring on the syrup in a thin stream. Once all the syrup is incorporated, add the vanilla extract to the mixture and continue to beat until cold. 6. Now remove the ice cream from the fridge and scoop into the centre of the sponge leaving a border of sponge of about an inch around the ice cream. Sprinkle the ice cream with the caramelised almonds then smother the lot with the meringue, ensuring it entirely covers the sponge and all the ice cream, leaving no gaps. A palette knife can be useful here. 7. 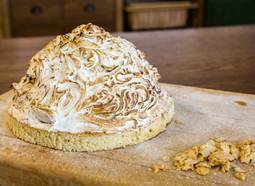 Fire up your blowtorch and colour the meringue all over. 8. Serve immediately with a glass of lightly chilled PX.